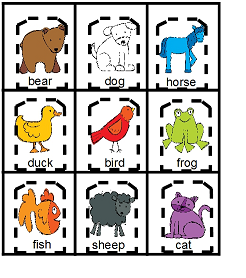 This week with my functional communication groups we will be using the “Brown Bear, Brown Bear” story boards to work on the concepts of colors & animals. 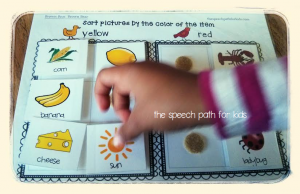 Communication targets emphasize requesting, choice making, sorting, labeling, and identifying. There is kind of a bear theme going on in February with my story and song choices of We’re Going on a Bear Hunt, Brown Bear, Brown Bear, and Bear Snores On. With our youngest class, we begin each session with an obstacle course to encourage movement and motor skills. The children get exposure counting to 10 while jumping on the mini-trampoline, walking across stepping-stones, and crawling through a tunnel. We play “We’re Going On a Bear Hunt” in the background. They have learned this song as a signal to our group beginning. Then we use “Open Shut Them” as our closing song. This consistency is very important and we are starting to see more interaction with gestures and verbal speech during these routines! Here is a copy of the lyrics we use (a variation from the video, but very similar). You could easily use this to begin a group also by changing the last line to “now our group will begin”. One of my students will sit in his for the entire group session – songs, stories, games, crafts – and then as soon as we start this song he hops up and puts his ear directly next to my mouth. I guess he wants this song up close and personal! To introduce this unit we will start by reading the book. The classroom teacher has a set of laminated construction paper that she uses as visuals during various activities, so we will practice identifying and labeling each color as we read the story. I love the simplicity and repetition of the repeated story line. 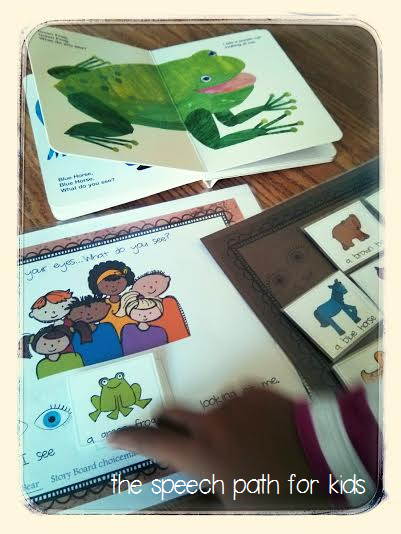 Using the story board, we can practice animals, colors, sentence structure, and even sequencing. We will also have an opportunity to work on color sorting. I have sorting mats set up to sort between two colors, but you could certainly use the variety of pictures to sort between 3+ colors. You could use construction paper for the sorting mats. Between the classroom teachers and myself, we also have plenty of plastic toys to be able to sort objects by color. Think about what you’ve got in your food, transportation, and animal units and you’ll likely have some options too! The simple structure within the “I have, Who has?” game is so helpful for my students learning how to ask or answer questions with peers (or with adults for that matter!). It can be played with or without the visual cues. I will usually separate the cards out among the adults and we form teams/groups with the students. We practice responding by raising our hand and saying “I do!” or “I have the ___”. We use hand-over-hand prompting when needed. This is also a great opportunity to practice picture identification. 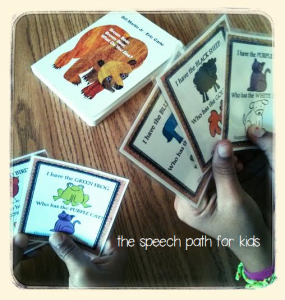 I have found this game to manageable with even my youngest functional communicators because it is interactive. They key is to have adult hands on deck to help manage the cards. If you find yourself the only adult in the group without the help of teachers, assistants, OTs or SLPS, try using a card holder to put the first 4 cards in and just rotate cards as you go through. I am so excited to introduce my groups to another game format within this unit – Zingo! 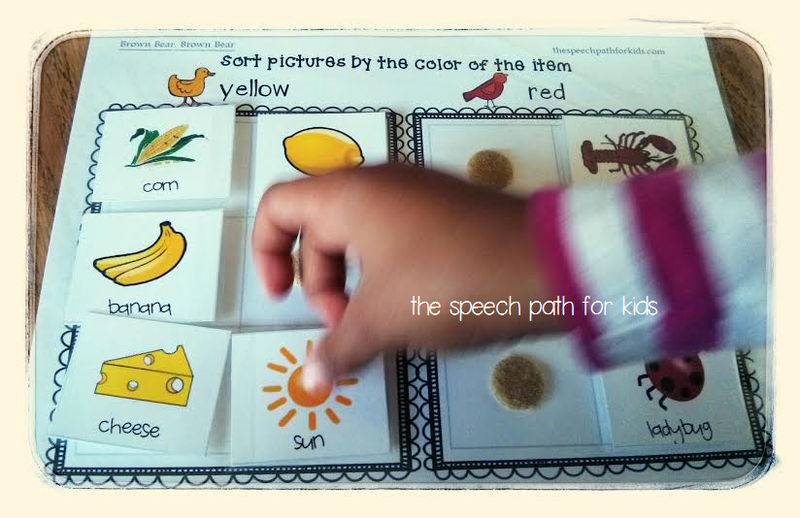 I have several sets at home – the basic objects, numbers, and sight words. I am excited to say that the numbers set is now getting converted to Brown Bear, Brown Bear and coming to school! Tammy at Fumbling Through Autism has created templates for many version of Zingo. I will follow my same strategy from “I have, Who Has” of giving a game board to each adult and we will work in teams to help manage the materials. For durability, I will print on card stock, laminate, then tape to the yellow Zingo pieces. I look forward to reading through Tammy’s blog even more, as she writes from a very important perspective: a mother! She shares a lot of practical and functional communication ideas. In case you need it, here is a simple communication board to go along with Brown Bear Zingo. I’m going to print this and stick it in a plastic cover…ready, set, communicate! Page two has the four square strip repeated so you can cut it and attach it to either the student’s Zingo board or on the desk/table in front of them. I always like to have several options available to make the communication more attainable. Enjoy!